We all know red is having a bit of a moment, we talked about it a while back, but wearing head to toe red isn't everyones cup of tea. Today I wanted to style a preppy look with a pop of red. The easiest and most delicate way to incorporate red is with a scarf and/or lipstick. I added both because they compliment each other nicely and well, because I adore wearing red lipstick. There's just something about it that feels empowering. Choosing which trends to rock each new season is very important, they need to suit your style and personality otherwise it will look unnatural and you won't feel the best in it, nobody wants that. I have declared my love for red since the beginning of the blog, so the fact that it became a trend this season is perfect. Don't you just love it when the styles you've adored for so long become the "it" trend of the moment?! I do! Back to today's outfit, like previously mentioned, I went for a preppy style. The jeans tucked in the pointy boots elongate my legs making me seem 5'9, which sadly I'm not. It's the perfect everyday look, put-together with a bit of heels yet comfy and warm with a pop of personality. Do you have a long affair with red? Wow, amazing outfit, dear! So lovely combination! Like it so much! The pop of red is my favorite! I love adding a touch of color to a look, this detail is everything! I love how you style it!! What a great color of lipstick on you! Such a great style. I love the scarf and the coat. Love that coat so much! Amazing style! I love red accessories, they totally make the look! Great post Darling! Wow! This is easily one of your best outfits dear! 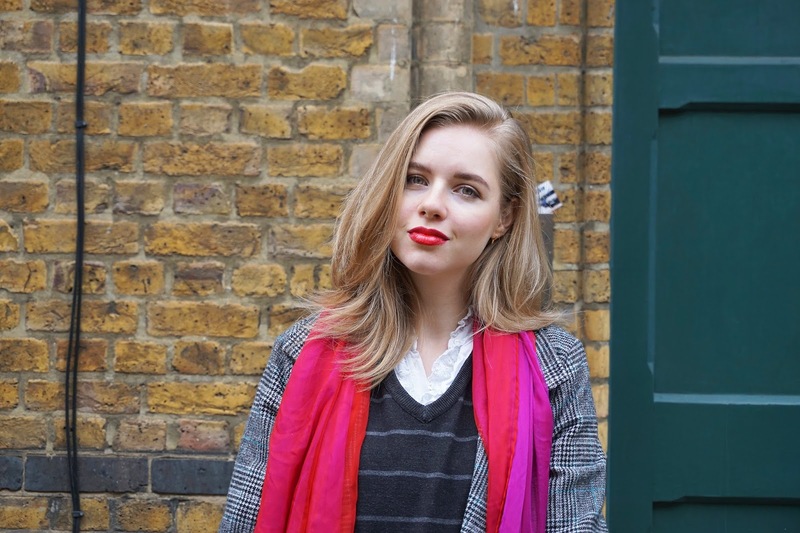 loving the blazer trend, and you effortlessly amped it with that lovely and vibrant scarf!